Describe a Person You have Seen Who is Beautiful or Handsome. This is the 3rd ielts cue card topic in the series of important ielts speaking cue card list 2019. You must try to speak this sample answer for more than two minutes. When and where you saw or met this person? Why do you think that person is beautiful or handsome? I have seen many beautiful and handsome persons in my life. Here, I would like to speak about a person whom I find the most handsome. He is my father. His name is Jeff Bezos. He is around fifty years old. He looks very handsome. His hair has begun greying, but he doesn't dye his hair. He usually wears kurta pyjama, but on some formal occasions, he likes to wear pants and shirts. My father is very health conscious and is very careful about his morning walk. He runs his own company and has about 25 people working for him. He is very down to earth person and is liked by all in our family and neighbourhood. The reason I find him the most handsome is not just because of his appearances, but also because of his caring and loving nature. I remember, once a person in our area met with an accident and required a blood transfusion. All his relatives backed out, but my father donated blood without even thinking twice. Whenever anyone needs any help, he goes out of the way to help him in whatever way he can. He is my father, but in him, I find a considerate friend. He listens to all my problems very patiently and guides me whenever I am in a difficult situation. Even in his business, he is loved and respected by all his employees. He believes in leading by example. He is always on time to work and so his employees also do the same. So, because of his qualities, I find him the most handsome or beautiful person. Well, I have seen various handsome individuals in my entire life. However, I would like to speak about the one who is a world-famous dancer, singer, and composer. She is known with her name as Shika. She is in her forties now and she could simply pass for twenty-five. She is actually a music prodigy, in her early age about eight years she wrote her 1st song with several accolades. Even though I had never seen her face-to-face, I usually see her in tv shows and concerts. I vividly remember that I saw her 1st time in songs which goes as "Daka-Daka". This song was composed for an opening day celebration of the soccer tournament. during those days I used to try all those dance steps that she did. However, sadly, I could not able to do it properly, as later I believed that I do not have the guts for dance. What does she do? She writes songs, sings together with dance. this is what makes her distinctive from others. She is a presenter also, she had helped to several charities through her concerts shows. She appeared so beautiful and handsome and whenever she does hip-hop dance, really her steps kill to me. Anyone may simply be enticed with her. Overall, I will say that she isn't only my favourite celebrity but also she is a beautiful or handsome person that I have ever seen or met. I have always been interested in knowing the fact that what makes people beautiful whether it is inner beauty or the outer beauty that makes a person attractive. Is what really makes him a handsome guy. this guy has a very attractive look.he is tall and has broad shoulders because he is really passionate about the gym and really takes care of his diet. He doesn't consume sugar and performs gym workout 5 times a week. Therefore, he is well maintained physically. It has been about3 years since I met him when he was helping some poor people. It really got my attention as he is a very soft hearted person.i have always seen him helping others whenever possible he is willing to help other mentally spiritually and financially. These are the two qualities that really make him handsome because real beauty is not only about outer aesthetics but also about inner thinking and heart. I feel really blessed to have a friend like him. 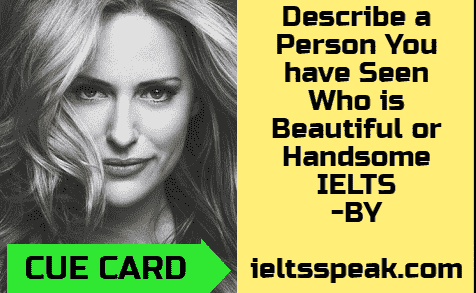 So this is the answer of cue card- Describe a Person You have Seen Who is Beautiful or Handsome.